“I wish we didn’t have to go back to Greenfield,” said six-year-old Benny Alden. Violet turned from the front seat of the car. “Don’t you miss our house?” she asked her little brother. “And our boxcar?” put in Henry, sitting next to Benny. Jessie, who was twelve, knew how Benny felt. Grandfather smiled at him in the rearview mirror. As they drove along the Blue Ridge Parkway, Henry spotted a sign. Henry laughed. “A rock hound is someone who collects rocks and minerals.” At fourteen, Henry was used to answering Benny’s questions. They turned off the main highway, following signs that led them from one twisting road to another. Jessie worried they would never find the gem mine—or their way out again! At last the thick woods parted to reveal a clearing. A large sign with a giant painted red jewel proclaimed they had arrived at Ruby Hollow. Grandfather followed the driveway into a crowded parking lot. They got out of the car and walked up a flower-lined path to a series of wooden buildings. At the main building, a man in a cowboy hat opened the entrance door and waved them inside. “I didn’t realize so many people would be here,” said James Alden. The children were looking at the framed photographs and newspaper clippings that hung on the wall. The pictures showed people holding red or blue stones. Some of the stones were pretty big. “What do you win in the contest?” asked Henry. Benny pointed to a photograph of a boy holding what looked like a big blue marble. “Violet, will you take a picture of me with my marbles?” he said. “Grandfather, can we stay?” Benny asked eagerly. He wanted to start digging for gems right away. “Come back to my office.” Mr. Knight led the way down a short hall. Knotty-pine paneled walls were crowded with more photographs. But these pictures were older, in black and white instead of color. While Grandfather registered, Benny studied a photo of two boys standing by a big wooden wheel. One boy grinned into the camera, but the other slouched with his hands in his pockets, frowning. Once they were checked in, Mr. Knight explained some of the procedures. “Let’s settle in first,” Grandfather said, taking the keys Mr. Knight handed him. “What funny names for cabins,” commented Jessie. After retrieving their luggage from the trunk, the children went to their cabins. Benny liked the one he was sharing with Henry. It had pine bunk beds and old-fashioned mining lamps hanging on the walls. “Top bunk is mine!” he claimed. The girls did, too. They were waiting outside the boys’ cabin. They walked down a trail marked FLUME. At the end was a booth. Grandfather paid the entry fees to the girl inside. The flume was directly ahead of them. A waterwheel turned wooden paddles, supplying a steady stream of fresh creek water that flowed through a long, V-shaped wooden trough. People lined both sides of the trough, sifting dirt in mesh-screened trays. Near one end of the flume was a stack of mesh-bottomed trays. “What’s a flume?” asked Benny. Benny recognized the waterwheel as the wooden wheel in the photograph in Mr. Knight’s office. The Aldens found places along the flume. People shifted to make room for them. A young man with sandy hair and glasses smiled at Benny. “Your first try at panning?” he asked. “It’s a lot of fun,” said Jonathan. “I’ll give you some pointers. First, don’t put too much ore on your tray.” He scooped some dirt from the bucket and dumped it onto each tray. “But my tray is still muddy,” said Jessie. The Aldens rinsed and tilted their trays, letting the muddy dirt wash away. “Is this good enough?” Benny asked Jonathan. After a while, Jonathan checked their trays. “Great! Now let’s see what you’ve got.” He sorted through the small stones in Violet’s tray first. “I can see there’s more to this than we thought,” Grandfather said with a laugh. “What do I have?” Benny asked. Jonathan examined the stones in Benny’s tray. He dropped a tiny stone into Benny’s palm. Jessie’s and Violet’s trays contained pretty chunks of pink quartz. Henry’s tray yielded a nice-sized garnet. “Not bad for your first day,” Jonathan pronounced. “I’ll walk with you up to the restaurant,” said Jonathan. They all turned in their trays and washed up at the old-fashioned outdoor pump. The restaurant was inside the main building. Outside the entrance, the menu was written on a chalkboard. Guests dined family-style at the big pine tables. Jonathan and the Aldens sat down. They were soon joined by a woman around Grandfather’s age and a dark-haired man wearing sunglasses and a white cotton shirt. “Is this your first day, too?” Benny wanted to know. He popped a hush puppy in his mouth, enjoying the crunchy sweetness of fried cornmeal and onion. “What brings you back?” Grandfather asked. He pulled a black velvet bag from his pocket and opened the drawstring. A large pinkish rock with red glints tumbled onto his place mat. As Jonathan reached for the rock, Donald deftly scooped it up and dropped it back into the velvet bag. “Can’t touch my contest winner,” he said jokingly. Cecil Knight came around with the coffeepot. “Coffee, anyone?” he asked. “Thanks,” said Donald. His napkin fell to the floor. Henry bent down to pick it up, but Donald planted his foot on the red-checked cloth. “I’ve got it,” he whispered hoarsely, bending down under the table. While Mr. Knight poured coffee into his cup, Donald took a long time to retrieve his napkin. “How did you all do on your first day?” Mr. Knight asked Grandfather. “I found a sapphire!” Benny exclaimed, pulling the small stone from his pocket. “I didn’t know bears ate carrots,” said Benny, making them all laugh. “Good luck tomorrow. Give Mr. Hodge some competition,” Mr. Knight said, moving on to the next table. Violet had been thinking about the Three Bears story. “What’s so special about a star ruby?” Jessie wanted to know. “Has anybody ever found a star ruby here?” asked Henry. to find one.” She gave a big sigh. “Maybe we’ll all be lucky this week,” said Henry. Just then the waitress returned with plates of peach cobbler topped with melting vanilla ice cream. At the same moment, Donald rose from his chair so abruptly he collided with her. Henry jumped up in time to save the tray from crashing to the floor. “Excuse me,” Donald said to the others at the table. “I’m not a big fan of peach cobbler.” He left the dining room. After dinner, the grown-ups lingered in the rocking chairs on the wide front porch. The Alden kids strolled down one of the trails behind the cabins. Crickets chirped their end-of-summer song. The mountains rose darkly around them. No moon or stars could be seen in the pitch-black sky. “I can’t wait to start looking for rubies tomorrow,” said Jessie. “We’d have to find a Papa Bear ruby bigger than Mr. Hodge’s,” said Violet. “We have as good a chance as anyone else here,” Jessie said confidently. “It sounded like a twig breaking,” Violet said, her heart pounding. What would be in the woods after dark? A bear? A fox? Everyone looked up at the sky. It wasn’t pitch-black anymore. A round, reddish light like a globe appeared over the peak of a distant mountain. The light hovered in the air a few seconds, then vanished. A moment later, the light reappeared, but in a different spot. Then it was gone again. “What?” chorused Jessie and Violet. “A flying saucer,” he replied solemnly. “Benny, there are no flying saucers,” Jessie said. “What else can it be?” he insisted. The children watched for a few more minutes. But the reddish round light did not reappear. They walked to the cabins. Lamplight shone through the window of the cabin next to Garnet, the girls’ cabin. Jessie glanced up at the sky once more. No strange light. She knew it wasn’t a flying saucer. But what else could it have been? Loud caws in the pine trees woke Jessie the next morning. The boys were waiting for them outside their cabin. The door to the cabin next to Violet’s and Jessie’s opened and Sybil Finley stepped out. Her cabin was called Sapphire. Jonathan was sitting at their table, scribbling in a notebook. “You keep a bird list?” Violet asked. “I should start a food list,” Benny said. Grandfather and Donald Hodge joined them. Donald wore a white button-down shirt. Violet thought it was strange he was so dressed up to hunt for rubies. “A flying saucer in North Carolina!” Sybil laughed. “You don’t really believe in that stuff, do you?” Donald scoffed. When he picked up his cup, he spilled coffee on the front of his shirt. “It’s okay,” Donald said. “There’s a Laundromat here.” He looked up just as Cecil came over. “In fact,” Donald said, “I’d better go there now.” He hurried away. “Did you kids see the Brown Mountain Lights last night?” Cecil asked. “No one knows for sure, but scientists believe the lights are formed from a combination of gases in the rocks in Brown Mountain. People have seen those lights over the mountain for a hundred years,” Cecil said. “No, I was working on my lists last night,” he said. Their waitress arrived with breakfast—“Gold Nugget” scrambled eggs, “Potato Pebble” fries, ham, and juice. Benny ate quickly. The mysterious lights were neat, but the idea of finding a Papa Bear ruby was even more exciting. He couldn’t wait to start! After breakfast, the children changed into old clothes and shoes and shouldered their backpacks. They met Grandfather in the Ruby Hollow Gem Museum. The glass cases displayed hundreds of gems and minerals. Brilliant red stones lay on white velvet, some faceted to catch the sun, some polished smooth as glass. One sparkling gem caught Violet’s eye. Benny was eager to find his own rubies. “Can we go now?” he asked. “Let’s hit the flume line!” Grandfather agreed. Outside, they took the path to the flume. Grandfather paid their entry fees and bought them each a five-dollar bucket and plastic containers for their findings. Jonathan and Sybil were already working on the flume. The kids found places between them. A few minutes later, Donald Hodge came down the path, pushing a wheelbarrow with six buckets. He squeezed between Grandfather and Violet, making everyone on the line adjust. Violet wondered why he just didn’t go to the end of the line. She noticed the dirt in his buckets was finer and darker than hers. “Your dirt looks different from mine,” she remarked. Benny had finished rinsing. He began sorting through his stones. “Is this a ruby?” he asked Jonathan, holding up a tiny pinkish stone. “Oh, boy! I found a ruby!” Benny dumped more dirt into his tray and began rinsing. 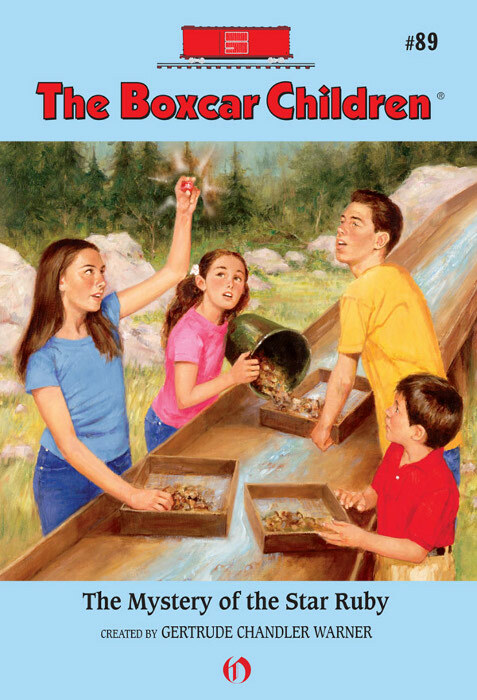 Jessie watched how fast Jonathan and Sybil worked, rinsing, sorting, and selecting stones before emptying the rest of the tray into the dumping pile behind the flume. Donald Hodge worked even faster, but he dumped half a bucket of dirt into his tray at a time and didn’t rinse properly. hot. Although the flume was shaded, panning was hot work. Finally, Donald threw his empty buckets into the wheelbarrow and left, disgusted that he hadn’t found a big stone. After three hours, the Aldens had finished going through their buckets. Everyone trooped to the grading window at the jewelry shop to have their stones weighed and inspected. Several people fell in line behind them, including Sybil Finley. Grandfather had some nice hiddenite. Henry and Jessie each had a couple of small sapphires and garnets. When it was Violet’s turn, she handed her plastic container across the counter. The gem inspector peered at her stone through a special lens on his glasses. Then he smiled at Violet. “You’re a better rock-finder than you think!” he said. “What did I find?” Violet asked anxiously. The man at the grading counter held up her stone between his thumb and forefinger. “I will. Thanks.” Violet slipped the plastic container into her pink backpack. As she headed for the door, she noticed Sybil Finley standing in line behind her. Sybil stared at Violet’s backpack with a frown. Then, without speaking to Violet or the other Aldens, she pushed her way out of the jewelry shop and headed toward the cabins. “What’s with her?” Henry wondered. “Is it time for lunch yet?” Grandfather asked. “Just thought I’d beat you to it!” said Grandfather. Everyone laughed as they walked up the path to the main building. Jonathan and Donald Hodge were sitting at their table in the dining room. Violet slipped her backpack off and hooked it on the back of her chair. Then she unzipped the outside pocket and handed Jonathan the plastic container. “Coming right out, sir,” she said. Henry wondered why Donald was always bugging the waitress. Everyone was hungry, but they’d learned to wait, since meals were served family-style. Why was he so impatient? Sybil Finley hurried into the dining room. She had changed into a white blouse and denim skirt. When she saw an empty chair next to Violet, she smiled. “I thought I was late,” she said. She pulled out the empty chair, bumping Violet’s bulky backpack. “Let me move that,” said Violet. “I’ll just put it over here.” Sybil shifted the backpack to the floor, on the side away from Violet. After a lunch of barbecue sandwiches, potato chips, pickles, and brownies, the Alden kids decided to spend the afternoon hiking. “May I have my backpack?” Violet asked Sybil. The kids took a trail on the other side of the flume. The path followed the stream that fueled the waterwheel. The sun blazed overhead, but a breeze stirred the treetops. “Great idea,” Henry said, unhooking the straps of his pack. The Aldens sat down on the rocks and took off their shoes and socks. Leaving packs and water bottles on a big rock, they stepped out on a sandbar. Giggling, the kids waded into the chilly, shallow water. Olive-green minnows darted around their ankles as they picked up interesting stones. “Let’s check it out,” said Benny, already halfway across the stream. On the opposite side, the kids clambered up the bank. They stared into the thick woods. “We can’t investigate without our shoes,” Jessie said sensibly. They recrossed the stream. On the other side, they put on their shoes and socks, then sorted out their packs. “Let’s look around for clues,” Violet suggested. Benny found something right away, a scrap of white cloth caught on a tree branch. That evening at dinner, a thunderstorm broke over the mountains. Everyone marveled at the echoing thunder and bold streaks of lightning. The Aldens glanced at one another. Violet frowned. She didn’t like to think of Jonathan doing something so dishonest. Dinner arrived and soon everyone was busy eating turkey with dressing and mashed potatoes. While the waitress served slices of coconut cake, Cecil Knight filled coffee cups. “Go-rilla cheese sandwiches!” Jonathan said. “What kind of a game is that?” Benny asked. “You know, Benny. It’s where you act out a word or a name and other people guess what it is,” Jessie replied. “Count me out,” said Donald. “I’ve got a good book to read.” He stood up to leave. “I won’t melt.” Donald disappeared into the stormy night. They all had fun guessing which animal each player acted out. When it finally stopped raining, it was time for bed. Since it was dark outside, Henry and Benny walked the girls to their cabin. Violet spotted something pink lying against the door. Jessie picked up her pack. “It’s a mystery!” Benny said eagerly. Later, after she and Jessie were in bed, Violet wondered about Jessie’s missing backpack. Who could have taken it? What had the thief been after? Then she thought of something. She sat up and switched on the lamp. “What is it?” Jessie asked sleepily. The next morning, the kids met outside Violet and Jessie’s cabin to discuss the mystery. “The ruby!” Benny said instantly. Although the ground around the girls’ cabin was muddy, it had rained again early that morning. If there had been footprints, they had washed away. The kids found Grandfather in the lobby of the main building, talking to Donald. They all went into the dining room. Jonathan and Sybil were already seated and had the local newspaper spread out on their table. “What’s in the news?” Grandfather asked, sitting down. “That’s terrible,” said Jessie, who loved to read. If the books in the library back home in Greenfield were ruined, she would feel awful. Everyone discussed the storm over a breakfast of French toast, sausage, and scrambled eggs. “How about if we go creekin’, instead?” Jonathan suggested. “Yeah!” the Alden kids chorused. “I think I’ll stay on the flume line,” Grandfather decided. “You’re selling your ruby to buy a sports car?” asked Henry.